Lovinsky Pierre-Antoine, a prominent human rights worker and Famni Lavalas activist, has been missing since August 12, 2007. He is the founder of Trant Septanm Organizasyon (September 30 Foundation) an organization that assists victims of the coup that took place September 30th, 1991. That coup ousted Haiti's first democratically elected Haitian President Jean-Bertrand Aristide only seven months after his inauguration. According to human rights groups there were five thousand people killed by the military regime of Raul Cedras. Thousands were also raped and tortured by the Cedras regime, and hundreds of thousands driven into hiding. Pierre-Antoine worked with many national and international human rights organizations to promote the rights of all people, particularly the right to justice. The perpetrators of the 1991 coup (the Haitian elite and their ex-military allies) gradually regrouped and in 2004 managed to overthrow Aristide again - this time with the overt backing of the US, France and Canada. In October 2005, at the first “International Tribunal on Haiti” that investigated the 2004 coup, Pierre-Antoine explained to an audience of hundreds in Washington how he had been arrested, assaulted and expelled from the country by authorities at the U.S. embassy in Port-au-Prince. Pierre-Antoine returned to Haiti after the presidential election of February 7th, 2006, which was won by Aristide protege Rene Gracia Preval. Lovinsky Peirre-Antoine was vocal in his demands for justice for the victims of the 2004 coup and for the return of Jean-Bertrand Aristide. Shortly before his disappearance, Lovinsky Pierre-Antoine was scheduled to visit the south of Haiti with an international human rights delegation, Fondasyon Mapou, which is run by Eugenia Charles. 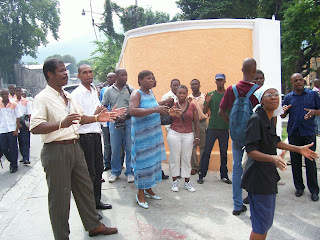 Part of the visit to southern Haiti was to include a visit with then political prisoner Rene Civil. Pierre-Antoine had also just announced his intention to run as a Fanmi Lavalas candidate in the upcoming round of parliamentary elections in Haiti. Lovinsky’s family has struggled to keep Lovinsky's case in the media spot light, but they haven't been alone. The kidnapping has rallied organizers in Haiti as well as solidarity activists abroad. In November, 2007 actor Danny Glover and other activists organized a 24-hour fast to call attention to Pierre Antoine’s disappearance. Amnesty International and Human Rights Watch drew criticism from people around the world for their lethargic response to the case. Human Rights Watch finally devoted two short sentences to the case in its 2008 World Report. Amnesty International did much better - albeit more than four months after Pierre-Antoine's disappearance. Amnesty issued a press release about the case on December 20, 2007, and also called on Haitian authorities to protect Wilson Mesilien, Pierre-Antoine's colleague at the September 30 Foundation (and also one of its founders), who had received numerous death threats. Amnesty followed up with another statement on January 10, 2008 after Mesilien and his family were driven into hiding. Haitian and UN authorities had ignored requests to protect Mesilien. "No. This happens often is Haiti. We are however very disappointed in the case of Lovinsky. International mobilization was weak and the Government of Haiti has not taken this case seriously enough." Events marking the one-year anniversary of the abduction and disappearance of Haitian human rights activist Lovinsky Pierre-Antoine took place in several major cities last week. Demonstrations and vigils were held in Port au Prince, Haiti where several hundred supporters marched to the Palace of Justice to demand that the government of President Rene Preval and the United Nations release a report on their investigations into his disappearance. Similar actions took place in London, Oakland and Los Angeles. Lovinsky Pierre-Antoine was last seen in Haiti after leaving a meeting with a human rights delegation from the United States and Canada on August 12, 2007. His abandoned vehicle was found the next morning and he has not been heard from since. Although his alleged abductors contacted friends and family two days later demanding a $300,000 ransom, most people including Amnesty International, believe this was a ruse to cover up what was actually a political abduction aimed at silencing Mr. Pierre-Antoine. They point to the fact that most kidnappers maintain contact in an effort to negotiate and arrange for payment. Amnesty International issued an appeal last January where they stated, "Lovinsky Pierre-Antoine's abduction was reportedly made to look like a kidnapping for ransom. On Tuesday 14 August, the alleged abductors called Pierre-Antoine's family asking for a ransom of USD 300,000. However there has been no further contact from the abductors." So who is Lovinsky Pierre-Antoine and why is there a growing chorus of international condemnation of the government of President Rene Preval and the U.N. regarding his case? According to Amnesty International, "Lovinsky Pierre-Antoine graduated in psychology from the Haitian State University and obtained further specialisation on child psychology in Montreal, Canada. He has been involved for several years as a grass-roots community organizer, mainly working with children. In the early 1990s, he co-founded the Foundation for the Support of Children (Fondsayon Kore Timoun Yo) for young street children in Port-au-Prince, and a centre for teenage mothers (Foyer pour Mères Adolescentes)." Mr. Pierre-Antoine is also one of the founders of the Fondasyon Trant Septanm (September 30th Foundation) and is a leading advocate and voice for victims of the 1991 brutal military coup in Haiti. He is also one of the fiercest critics of the ouster of President Jean-Bertrand Aristide in February 2004 and is closely associated with his Lavalas political movement. Mr. Pierre-Antoine was appointed General Coordinator of the National Office on Migration during the last presidency of Jean-Bertrand Aristide and was forced into exile after the U.S-installed regime of Gerard Latortue took power. He returned to Haiti to continue his human rights work in February 2006. Brian Concannon is an attorney who works with a rights group called the Institute for Justice and Democracy in Haiti or IJDH. Mr. Concannon, who is also a close friend and colleague of Mr. Pierre-Antoine, spoke of his decision to return to Haiti in 2006, “I know it was a difficult decision for Lovinsky, because he knew the risks, and he had a family that he loved. But in the end, Lovinsky felt he could not stay out of Haiti any longer, that he was needed to help organize progressive grassroots voices in Haiti.” Concannon recalled the pressure Mr. Pierre-Antoine faced after returning to his homeland, “I last saw Lovinsky in person in February 2007. At the time he was receiving threats, and frequently changing where he slept. He knew he was in danger, but also knew that in Haiti’s democratic transition that the traditional forces would have the upper hand. 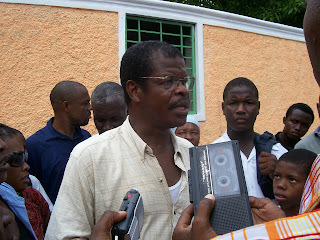 He knew that if the people did not organize, life would become more difficult for the majority of Haitians who are poor.” Days before his abduction, Lovinsky Pierre-Antoine announced his intention to run as a candidate for the Haitian Senate under the banner of the Fanmi Lavalas Party, Jean-Bertrand Aristide's political party. Wilson Mesilien, who has been standing in for Mr. Pierre-Antoine as Acting Director of the Fondasyon Trant Septanm, has condemned what he has called "a wall of silence" when referring to the investigation of Lovinsky Pierre-Antoine's disappearance by the government of President Rene Preval and the United Nations in Haiti. A lack of any discernable progress made by them in the case has led to speculation ranging from a concerted effort to keep Mr. Pierre Antoine's disappearance quiet to charges of complicity in his abduction. Other critics point to numerous death threats made against Mr. Mesilien and his family as proof of an organized effort to silence criticism of the authorities concerning their lack of a serious investigation. Amnesty International was moved to issue an appeal last December "calling for the authorities to ensure Wilson Mesilien’s protection in accordance with his wishes." Equally disturbing is the fact that the United Nations leadership has failed to recognize Lovinsky Pierre-Antoine’s abduction and disappearance altogether. According to a report delivered to the U.N. General Assembly on January 10, 2008 by the Working Group on Enforced or Involuntary Disappearances (WGEID), there were no reported instances of persons disappeared in Haiti during the year 2007. The WGEID is part of the U.N. High Commission on Human Rights and as such is in the loop to receive regular human rights reports filed by the U.N. mission in Haiti. Whatever the reason behind the omission of Mr. Pierre-Antoine’s case in the WGEID’s report, it is sure to stoke fears of an organized effort to cover-up the facts of his abduction and disappearance one-year ago in Haiti. Demonstrations and vigils demanding accountability in the investigation of the disappearance of Lovinsky Pierre-Antoine, like those that occurred last week, are expected to continue to grow as a result.